Overlooking Gorey harbour, Mont Orgueil Castle (aka Gorey Castle, the Old Castle and Le Vier Chate) was constructed following the division of the Duchy of Normandy in 1204. The Castle remained the first line of defence against French invasion until the construction of Elizabeth castle in 1594. Thereafter, it was converted into a prison, often holding political agitators such as William Prynne from the English mainland, and then for use as barracks. 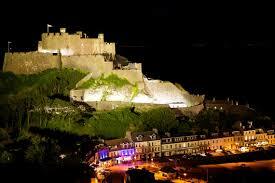 It was occupied by German forces during the second world war, and now appears on the Jersey £50 note. The Castle also hosts ‘living history’ days, complete with jousting knights, and Chris Levine and Rob Munday’s exhibition ‘The Queen’ (featuring an impressive holographic portrait of Her Majesty). The Castle was featured in a Time Team episode in 2011 and has a licensed café and gift shop. A great attraction for kids.